JB47 Black Backing Aurora Borealis Crystal AB Rhinestone Silver Beaded Applique Iron-On 6"
Catalog > JB47 Black Backing Aurora Borealis Crystal AB Rhinestone Silver Beaded Applique Iron-On 6"
Aurora Borealis rhinestone Silver Beaded Applique on Black Mesh Backing. and Aurora Borealis Crystal AB Rhinestones. 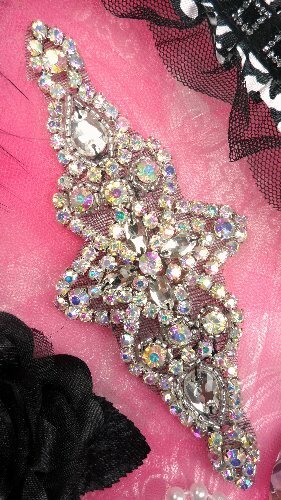 Great for Bridal gowns and evening wear. set in prongs and very beautiful.